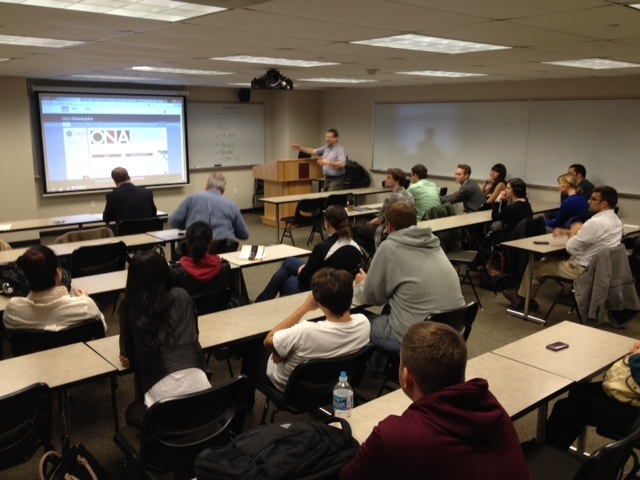 The early crowd at Thursday’s Future of College Media ONA event. College newspapers are facing the same challenges of their commercial counterparts have had for decades but, despite their advantages, are struggling to fundamentally innovate. Nearly 40 professional journalists, students and college administrators attended representing a half dozen universities and student newspapers attended Thursday the Future of College Media event I helped organize with Temple University Journalism Department Chair Andy Mendelson for our monthly local Online News Association get-together. None of the newspapers represented had made any revenue outside of print and web advertising. Universities should host the newsrooms of their neighborhoods, towns and counties. If a university has a journalism department, college media and audience, this seems like a foregone conclusion. Picture Temple University. It is a big, diverse, robust, public research university with a clutch of respected professional schools and an expansive undergraduate population that has been slowly and controversially expanding into at least four different, distinct, overwhelmingly black neighborhoods around it. When you drive south on I-95 east of Philadelphia at night, look off to your right while only the tallest skyscrapers are yet in view a few miles in the distance, the blur of bright lights made of a dozen square blocks and a cluster of high-rise buildings among a swath of stout two story row homes is the university’s main campus. Halfway between those stadium lights and Philadelphia’s iconic City Hall is another beacon of light, that old White Lady, 400 North Broad Street, the legendary location of the Philadelphia Inquirer and its sister paper the Daily News. Mood lighting isn’t the only lesson Temple should take from the investigators of the Inquirer. It was sometime this month two years ago that, while still an undergraduate at Temple University, I started tossing around what I hoped to be a new tagline for The Temple News, the college newspaper on North Broad Street. Weekly in Print. Daily online, I suggested. I wrote it on a piece of paper and posted it in my cubicle, as editorial page editor. In the mid-1990s, our newspaper staff rather presciently decided to move from printing three days a week to just once, having already dropped from a daily a few years earlier. The intent, a front-page story read at the time, was to reduce costs at a time when the Internet would soon be the source of all news. Gosh, they were a bit too early, but dead on. So, they’d update daily online and follow-up with the biggest stories weekly. Sitting at my then clean and empty desk in Room 243, the newsroom of The Temple News, on May 21, 2008, the night before my college graduation. One year ago I was cleaning out my desk in Room 243, the newsroom of The Temple News, the college newspaper of Temple University since September 1921. I spent one year as a reporter, one year as a columnist, one year as a contributor and one year as an editor. It is, truly, where I first developed the craft, came to understand the rules and learned journalism and writing was a real professional opportunity. I got a lot out of Room 243, TTN’s newsroom in the student center at 13th and Montgomery in Philadelphia, Pa. So, I thought it was worth revisiting what I did, what I learned and how it has affected me now 12 months clean. 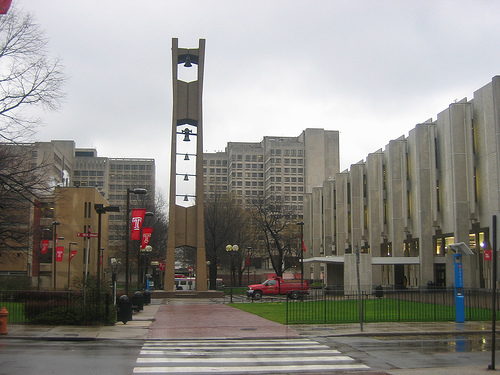 Earlier this year I posted a column I wrote for The Temple News, the college newspaper for which I worked while still an undergraduate at Temple University, about ghosts on its Main Campus. It was popular then, so why not now, just one short year later? Temple has been built on the backs of the dead. It’s late October, and we think about the old, the hidden and the dead. Temple University has its ghosts, indeed. This is its beginning. Read the piece in its entirety or see other writing of mine here. At my desk in the newsroom of The Temple News after graduating and cleaned out May 21, 2008. In April I wrote a piece to run in the commentary section of The Temple News but never ran it. My last column was an open letter to the university’s President Ann Weaver Hart. Since last week I shared video of my commencement address, on which this column focuses, I thought I would share the column that never was. I am your commencement speaker. A committee of professors and administrators have decided that I am serviceable enough to represent my 4,000 fellow graduates on Temple University May 22 commencement ceremony. I will speak to you, our families and our friends, more than 8,000 people in the Liacouras Center. But, I, too, have sat through graduation speeches of little note and boring memory. I want this to be yours as well. I am graduating. After four years on North Broad Street – two more than you – I have plenty I want to share with you. Space is limited, so forgive my suddenness. Throw your students into the surrounding communities. For 45 years, this university has tried to figure out how to trick middle-class students into studying amid one of this country’s densest collections of black people, many of them poor and uneducated. So we built walls and took publicity shots facing south. We closed North Park Avenue, tried to close 13th Street and turned inward. So, each year, a portion of accepted students confuse Temple with shootings at the Norris Apartments and confuse Philadelphia with an abandoned row home at 20th and Diamond streets. That’s backwards. Have Provost Lisa Staiano-Coico amend our new general education requirements to involve 10-credit hours of “community education.” The engineering students can take a class on the most efficient means of backfilling condemned buildings, architecture students can figure out what’s wrong with the North Philadelphia subway stop, and students of the social sciences can work with the nonprofits that are trying to help our neighbors. Leverage our intellectual capital and market it as the most unique academic experience in the world. Yesterday I wrote for The Temple News another in a series of stories on a controversy surrounding the possibility of Joe Frazier’s Gym closing. There will be more to come, for sure. Joe Frazier has developed a reputation for business failings that rival his status as a boxing legend. That much is confirmed by those closest to him. But debate over the recent closure of Joe Frazier’s Gym, the North Philadelphia landmark at North Broad Street and Glenwood Avenue, has pitted a British boxer and her fiancé-manager against the 20th century sports icon’s business manager. For the next month, at least, I am a student journalist. I have been a proud staffer at The Temple News serving the community of Temple University in Philadelphia for four years. While I have reported for the Philadelphia Inquirer, the Philadelphia Business Journal and elsewhere, there are few places I’ve learned more than in Room 243, the newsroom of The Temple News, and otherwise in my functions as a student journalist. There are so many complications to it all. Particular to working at a big university in a big city, I am inevitably competing with professional journalists, without seeming reactionary or amateurish. Competing with the very people whom I hope will want to hire me. At a school like Temple a great deal of our coverage is high profile enough to merit attention from the faces that make Philadelphia the fourth largest media market in the country.